An electrocardiogram (EKG or ECG) is a device which graphically records the electrical activity of the muscles of the heart. It is used to identify normal and abnormal heartbeats. First invented in the early 1900s, the EKG (derived from the German electrokardiogramma) has become an important medical diagnostic device. The function of the EKG machine depends on the ability of the heart to produce electrical signals. The heart is composed of four chambers which make up two pumps. The right pump receives the blood returning from the body and pumps it to the lungs. The left pump gets blood from the lungs and pumps it out to the rest of the body. Each pump is made up of two chambers, an atrium and a ventricle. The atrium collects the incoming blood, and when it contracts, transfers the blood to the ventricle. When the ventricle contracts, the blood is pumped away from the heart. The pumping action of the heart is regulated by the pacemaker region, or sinoatrial node, located in the right atrium. An electrical impulse is created in this region by the diffusion of calcium ions, sodium ions, and potassium ions across the membranes of cells. The impulse created by the motion of these ions is first transferred to the atria, causing them to contract and push blood into the ventricles. After about 150 milliseconds, the impulse moves to the ventricles, causing them to contract and pump blood away from the heart. As the impulse moves away from the chambers of the heart, these sections relax. Using an EKG allows doctors to measure the relative voltage of these impulses at various positions in the heart. Electrocardiograms are possible because the body is a good conductor of electricity. When an electrical potential is generated in a section of the heart, an electrical current is conducted to the body surface in a specific area. Electrodes attached the body in these areas enable the measurement of these currents. The electrical signals measured by the EKG have been characterized and represent various phases of a heartbeat. Each time the heart beats, it produces three distinct EKG waves. The first pulse that is seen is called the P wave. This measures the electrical signal generated by the pacemaker. The next pulse is the largest signal and is called the QRS complex. This segment of the graph represents the electrical signal created by the relaxing of the atria and the contraction of the ventricles. Completing the cycle is the T wave, which signifies the relaxing, or repolarization, of the ventricles. The characteristic sound of a heartbeat corresponds to the QRS complex and the T wave. EKGs provide useful data and can help detect various problems related to heart function. One basic determination that can be made with an EKG is the heart rate, which can be determined by measuring the distance between peaks. Diagnosis of certain medical problems is also possible. For example, in patients with high blood pressure, the amplitude of the QRS complex is significantly increased. The balance of certain chemicals in the body can also be detected by an EKG, since the amplitude of the signals is related to the levels of chemicals in the body. Damage in the heart can also be observed by a deformation in the Q wave. The most useful characteristic of the EKG is its ability to detect and describe arrhythmias, or abnormal heartbeats. EKG machines known as Holter monitors are for these detections. Finally, EKGs can be used to observe obstructions in the arteries. This is typically done by looking for a depressed segment between the S and T waves. The development of the EKG began with the discovery of the electronic potential of living tissue. This electromotive effect was first investigated by Aloysio Luigi in 1787. Through his experiments, he demonstrated that living tissues, particularly muscles, are capable of generating electricity. Afterwards, other scientists studied this effect in electronic potential. The variation of the electronic potential of the beating heart was observed as early as 1856, but it was not until Willem Einthoven invented the string galvanometer that a practical, functioning EKG machine could be made. The string galvanometer was a device composed of a coarse string that was suspended in a magnetic field. When the force of the heart current was applied to this device, the string moved, and these deflections were then recorded on photographic paper. The first EKG machine was introduced by Einthoven in 1903. It proved to be a popular device, and large-scale manufacturing soon began soon in various European countries. Early manufacturers include Edelmann and Sons of Munich and the Cambridge Scientific Instrument Company. The EKG was brought to the United States in 1909 and manufactured by the Hindle Instrument Company. 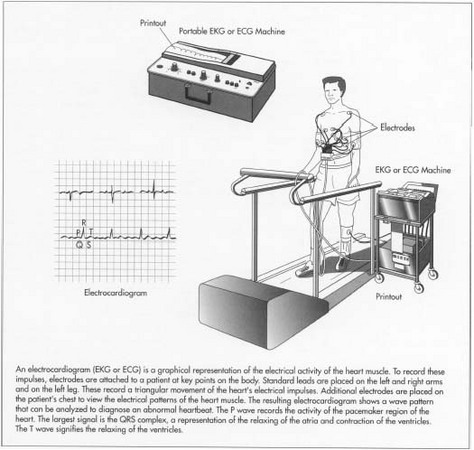 Improvements to the original EKG machine design began soon after its introduction. One important innovation was reducing the size of the electromagnet. This allowed the machine to be portable. Another improvement was the development of electrodes that could be attached directly to the skin. The original electrodes required the patient to submerge the arms and legs into glass electrode jars containing large volumes of a sodium chloride solution. Additional improvements included the incorporation of amplifiers, which improved the electronic signal, and direct writing instruments, which made the EKG data immediately available. The modern EKG machine is similar to these early models, but microelectronics and computer interfaces have been incorporated, making them more useful and powerful. While these newer machines are more convenient to use, they are not more accurate than the original EKG built by Einthoven. The EKG machine consists of electrodes, connecting wires, an amplifier, and a storage and transmission device. The electrodes, or leads, used in an EKG machine can be divided into two types, bipolar and unipolar. The bipolar limb leads are used to record the voltage differential between the wrists and the legs. These electrodes are placed on the left leg, the right wrist, and the left wrist, forming a triangular movement of the electrical impulse in the heart that can then be recorded. Unlike bipolar leads, unipolar leads record the voltage difference between a reference electrode and the body surface to which they are attached. These electrodes are attached to the right and left arms and the right and left legs. Additionally, they are placed at specific areas on the chest and are used to view the changing pattern of the heart's electrical activity. Various models of electrodes are made, including plate, suction, fluid column, and flexible, among others. Plate electrodes are metal disks which are constructed out of stainless steel, German silver, or nickel. They are held onto the skin with adhesive tape. Suction electrodes use a vacuum system to remain in place. They are designed out of nickel or silver and silver chloride and are attached to a compressor that creates the vacuum. Another type of electrode, the fluid column electrode, is less sensitive to patient movement because it is designed to avoid direct contact with the skin. The flexible electrode is most useful for taking EKG readings in infants. It is a mesh woven from fine stainless steel or silver wire with a flexible lead wire attached. The electrode attaches to the skin like a small bandage. EKG amplifiers are needed to convert the weak electrical signal from the body into a more readable signal for the output device. A differential amplifier is useful when measuring relatively low level signals. During an EKG, the electrical signal from the body is transferred from the electrodes to the first section of the amplifier, the buffer amplifier. Here the signal is stabilized and amplified by a factor of five to 10. An electronic network follows, and the signal from the unipolar leads is translated. A differential pre-amplifier then filters and amplifies the signal by a factor of 10 to 100. The sections of the amplifier which receive direct signals from the patient are separated from the main power circuitry of the rest of the EKG machine by optical isolators, preventing the possibility of accidental electric shock. The primary amplifier is found in the main power circuitry. In this powered amplifier, the signal is converted to a current suitable for output to the appropriate device. The most common form of output for EKG machines is a paper-strip recorder. This device provide a hard copy of the EKG signal over time. Many other types of devices are also used, including computers, oscilloscopes, and magnetic tape units. Since the data collected is in analog form, it must be converted to digital form for use by most electronic output devices. For this reason the primary circuitry of the EKG typically has a built-in analog to digital converter section. Various other parts are needed to complete the EKG unit. Since the signal is weakly transmitted through the skin to the electrodes, an electrolyte paste is usually used. This paste is applied directly to the skin. It is composed primarily of chloride ions which help form a conductive bridge between the skin and the electrode, allowing better signal transmission. Other components include mounting clips, various sensors, and thermal papers. The components of an EKG machine are typically manufactured separately and then assembled prior to packaging. These components, including the electrodes, the amplifier, and the output device, can be supplied by outside manufacturers or made in-house. 1 The most common electrode used for an EKG machine is the silver and silver chloride electrode because the electrode potential of these electrodes is stable when exposed to biological tissue. The electrodes are received from outside suppliers and checked to see if they conform to set specifications. The type of electrode used depends on the EKG model. Often multiple types of electrodes will be supplied with one EKG machine. Each electrode contains a shielded cable that can be attached to the primary unit. 2 The electronic components of an EKG device are quite sophisticated and use the latest in electronic processing technology. The amplifier and output device are assembled much like that of other electronic equipment. It begins with a board that has the electronic configuration mapped out. This board is then passed through a series of machines which place the appropriate chips, diodes, capacitors, and other electronic pieces in the appropriate places. When completed it is sent to the next step for soldering. 3 The electronic components are affixed to the board by a wave soldering machine. Boards that enter this machine are first washed to remove any contaminants. The board is then heated using infrared heat. The underside of the board is passed over a wave of molten solder which fills in the appropriate spots through capillary action. As the board is allowed to cool, the solder hardens, holding the pieces in place. 4 Depending on the type of display device, manufacture method differs. Certain devices such as magnetic tape recorders and paper printers can be supplied by outside manufacturers. Other components like computer microprocessors can be designed and made right along with the primary internal electronics. 5 The components of the EKG machine are assembled and placed into an appropriate metal frame. The finished devices are then put into final packaging along with accessories such as spare electrodes, printout paper, and manuals. They are then sent out to distributors and finally to customers. To ensure the quality of each EKG device being manufactured, visual and electrical inspections occur throughout the entire production process, and most flaws are detected. The functional performance of each completed EKG device is tested to make sure it works. These tests are done under different environmental conditions such as excessive heat and humidity. Most manufacturers set their own quality specifications for the EKG machines that they produce. However, standards and performance recommendations have been proposed by various medical organizations and governmental agencies. Some factors considered important are standardized input signal ranges, frequency response, accuracy of calibration signal, and recording duration. In the future, more powerful and improved EKG machines will be developed. These machines will utilize the latest computer technology, making diagnosis quicker and more accurate. They will be more powerful and capable of measuring tiny electronic potentials such as fetal heart rates. They will also make it possible to construct three-dimensional models of the beating heart, providing doctors with more diagnostic data. New applications for EKG machines may also be found, such as the recent application of an EKG machine to determine the efficacy of drugs. A recent innovation could mark a new direction in EKG development. One company has developed a portable EKG monitor which collects data that can be transmitted directly over the phone. The patients puts the electrodes under each arm and attaches a transmitter to the phone mouthpiece. The signal is sent to a monitoring center, where computers convert it to EKG readings. This information can then be transferred to a doctor, making it possible to detect heart problems in some patients much earlier. Lawrie, T.D. Veitch and Peter Macfarlane. Comprehensive Electrocardiology. Theory and Practice in Health and Disease. Pergamon Press, 1989. Koyuncu, Baki. "Monitoring Heartbeat." Electronics World & Wireless World, July 1995, pp. 605-7. Roberts, H. Edward. "Electrocardiograph I." Radio-Electronics, July 1991, pp. 31-40+. Roberts, H. Edward. "Electrocardiograph II." Radio-Electronics, August 1991, pp. 44-49.